Marie Bostwick introduced the larger-than-life Mary Dell Templeton as a secondary character in her first Cobbled Court Quilt novel, A Single Thread (2008). She then told the first part of Mary Dell’s story in Between Heaven and Texas (2013). From Here to Home picks up the story thirty years later. Quintessential Quilting, the quilting show that Mary Dell has hosted with Howard, her son born with Down Syndrome, has been successful for many years, but the show’s ratings are declining. A new broom at the network who wants to see the show axed succeeds in getting Howard replaced as co-host and making Mary Dell’s new contract a one-year deal. Meanwhile, it has become clear to Mary Dell that she needs to spend more time at home in Too Much. Her mother is growing older and has some health problems. Her twin sister’s children for whom Mary Dell has served as a substitute mother since their mother’s death are also in trouble. Her nephew, Rob Lee, a veteran suffering from untreated depression and PTSD, has hit a dangerous downward spiral, and her widowed niece, Cady, still grieving for her husband killed in Afghanistan, is overwhelmed by her responsibilities for a six-year-old daughter, the family ranch, and Patchwork Palace, Mary Dell’s quilting shop. Changing the location of her show from Dallas to Too Much may offer a solution to some of these problems, but Mary Dell is not prepared to find Howard not at all upset by his firing but rather excited at the thought of an independent life in Dallas where he can begin community college and spend time with his girlfriend. Her “baby” may be looking toward his thirtieth birthday, but Mary Dell finds it difficult to accept his independence. Holly Silva, daughter of aging star Rachel McEnroe, inherited her mother’s beauty but not her acting skills or musical gift. Thrilled when her agent lines up an interview for co-hosting duties, she is considerably less pleased when she finds that the show is about quilting, a craft about which Holly knows nothing, and she is dismayed to be told that she is expected to sabotage Quintessential Quilting. A quick course in quilting from Cady has Holly feeling more confident about the show, and the firm friendship that develops between her and Mary Dell has them both determined to thwart the plans of the jerk in charge of network programming. Both women also find their lives complicated by romance. Mary Dell is surprised when her long-time friendship with wealthy Texas hotelier Hubbell James Hollander, known as Hub-Jay, turns into a love affair complete with marriage proposal. But there is a small problem; Mary Dell has never divorced the husband who abandoned her nearly thirty years ago. Holly tumbles into love with Rob Lee Benton, but he has yet to completely conquer his demons. Is an HEA possible for either of these couples. Bostwick gives her reader a large cast of vividly drawn characters in From Here to Home, but Mary Dell is the heart of the book. In a large sense, it is she who defines home for the others. Holly and Rob Lee’s romance is sweet and emotionally gratifying, but words are inadequate to describe my delight in having a sixty-year-old heroine who lives fully in all the areas of her life. 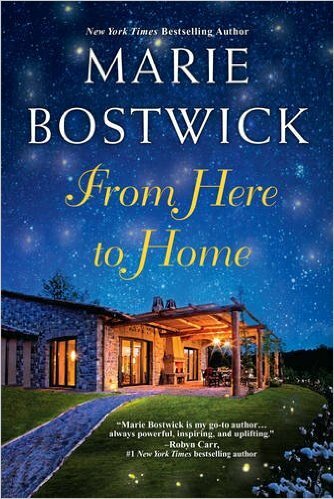 A less gifted writer might have gone for the clichéd conclusion and reunited Mary Dell and Donny, but Bostwick has the changes the years have brought to Mary Dell include more mature judgment and taste in men. Mary Dell appreciates that Hub-Jay is still a good-looking, virile man, but she appreciates him for other qualities as well. When she was younger, she doubted she would have found Hub-Jay attractive. But she wasn’t young now. She understood things she hadn’t at twenty, thirty, or even forty—the value of steadiness and patience and humor, and that kindness trumped looks any day of the week. . . . She understood too the value of a man who was not threatened by female intelligence or ambition, a man who was comfortable in his own skin and didn’t demand that you turned yours inside out for him. I loved this book, and I highly recommend it, especially for readers who like women’s fiction with a rich mix of humor and romance. Thanks for a great review!! Will have to check this book out.